I have hung my first hummingbird feeder for the season and am following the northern migration of the ruby throated hummingbirds via Hummingbird Central. Hummingbirds are a favorite of mine, sword wielding acrobats buzzing through the backyard, protecting and feeding, and sometimes making peace with their fellow birds. I have had an urge to make some postcards for fun and to use as examples for upcoming Creative Commons presentations. I did it in March 2018, mostly using images found at the Digital Public Library of America. That is where I started this year, too. 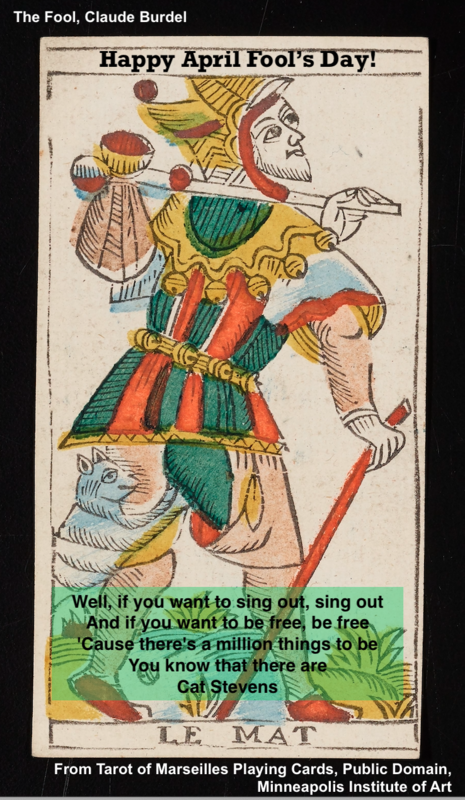 I don’t think there is any connection between April Fool’s Day and the The Fool, “first” card of most Tarot decks. I use the marks because it is usually numbered 0. Tarot cards, once the stuff of carnival midways and roadside shacks, are making their mark in the mainstream. The Tarot of Marseilles dates back to the mid-17th century. It has roots in Switzerland and the card I used was created in 17551 by Claude Burdel, a master card maker and engraver in Fribourg, Switzerland. I found the card and went looking for “foolish” poems. The lines from Cat Stevens seemed to float to the top of my brain. And that made me think about my favorite movie, Harold and Maude. The ending is one of the best I can remember. NOTE: this is THE ENDING, so if you haven’t seen the movie, don’t watch it. Go watch the movie, instead. I have also been a reader, you know, that kid on the bus curled up with a book. I once missed my bus stop because I was tucked behind the seat reading so intently I missed the stop, and the bus driver didn’t see me. In the days before cell phones, I remember it being pretty traumatic. Someone called someone who called my mom to let her know I would be very late as the driver had to do the whole rest of the route. The last two books I’ve read have both been a celebration of books and reading and I felt like I spent a week with people who understood that little girl behind the bus seat. In Well-Read Black Girl, Glory Edim has collected heartbreaking, joyful essays by women of color about the books they loved, particularly the ones that seemed to draw from their lives, honoring those stories and inspiring these women to tell their own. Schwalbe suggests we should each construct a list of the books that have been important to us. It may change but those changes will be of interest, too. I’ve been thinking about that list but am not ready to share it yet. I would love to hear what might be on your own list. Meanwhile, I have another book to read. The Last Witchfinder defies description a little bit: maybe historical fantasy? Author James Morrow follows the horrific history of witch finding in the early to mid 1700s from England to America through the character of Jennet Stearne. The daughter and sister of witchfinders and niece of an accused witch, she spends her life trying to come up with a grand argument that would legally undermine the witch laws, using Newton for her guide. Along the way, she is abducted by Algonquin Indians, shipwrecked with Ben Franklin, and accused of witchcraft herself. And, in an oddly fascinating twist, the narrator is Newton’s Principia Mathematica, the text that Jennet used for her argument, and in the interludes, the book describes its battle against the Malleus Maleficarum, the witch hunting handbook. Here’s where fantasy really takes over. What I really loved, however, was the rich, evocative writing, often ironic, and sometimes just fun. I heard Thoreau echoing in that last bit: “the mass of men lead lives of quiet desperation” he write in the opening of Walden. Perhaps cybernetic desperation is not so quiet: living our lives within view of everyone, seemingly all the time. Ornithologist Scott Weidensaul’s book Of a Feather: A Brief History of American Birding, is a loving portrait of American birding, including the fathers AND mothers of birding. Weidensaul also describes two types of people who chase birds: listers and birders. Listers chase birds, spending money and time to find the most unusual and exotic to add to their life lists. They are encouraged by annual competitions to see who can get the most birds in their Big Year. Weidensaul describes their enthusiasm when they see a new bird, but they quickly lose interest in the birds the moment they have made the check mark on the list. They are immediately on to the next bird. Weidensaul suggests that the second type of people who chase birds are really the birders: those who care less about the list and more about the birds themselves. They are excited by the unusual but also intrigued with the familiar. The author seems to come down on the side of this second type, those who genuinely enjoy birds rather than aggressively pursuing the list. The blurb from The Washington Post on the cover calls the book gossipy and scholarly and that’s just about right as the author has hung out with the contemporary folks and likes telling tales about the characters from the past. Challenges can be positive ways to change habits and push limits. But, when the challenge itself becomes the focus, it can lead to superficial successes.